The Geneva Historical Society’s latest exhibit project, Music in the Key of Geneva, will be found in various public venues and events over the course of 2016 and 2017. This project is both an exhibit and an effort to document and share the musical heritage of the community. From international stars who have performed at Club 86 and the Smith Opera House to locals who get together and play every week, Geneva has a rich musical heritage. Music in the Key of Geneva presents and chronicles that history. There are five sets of mobile exhibit panels displayed on bright green screen doors that will travel around public spaces over the next year. Panel topics cover music in the schools, rock and roll, religious music, and professional musicians who grew up in Geneva, among others. Panels are currently (fall 2016) on display at the Geneva Public Library, the Visitor’s Center on the lakefront, the Geneva Community Center, and the Smith Opera House. In addition, podcasts and articles related to the exhibit can be found on our blog and audio collections web pages. 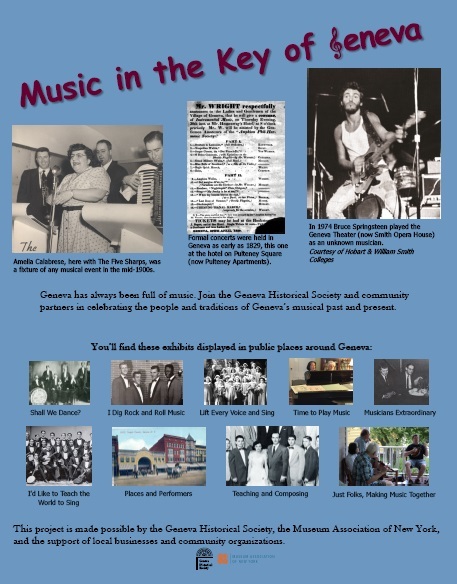 The Geneva Historical Society is interested in collecting further information about music and music making in Geneva. Anyone with material to contribute, such as recordings, photos, or stories to share about music that was performed in Geneva should contact Curator of Collections and Exhibitions John Marks at 315-789-5151 or jmarks@genevahistoricalsociety.com.